Discover the best of both worlds with the Convertible Brow Powder & Pomade Palette from The BrowGal. 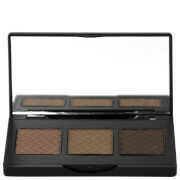 The Convertible palette is host to a trio of brow shades, a warm, neutral and ash tone that can each be used dry as a powder or wet as a pomade. Three different hues allow you to color match to your brows perfectly, use each shade alone or combined to create the ideal custom blend. The versatile palette allows you to become your own brow artist. Firstly apply the hues as a powder, the powder formula is able to fill in the sparse areas within brows, whilst also adding volume and detail. For a high definition, 3D finish, mix the powder shades with water to create a pomade, this results in an ultra-glam, defined finish. 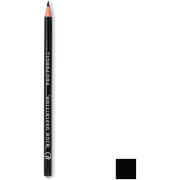 Easy to apply, the powder or pomade can be used over a brow pencil and is buildable, which is ideal when creating the perfect brow for you, from a natural look to an ultra-defined finish. With the spoolie end of the Precision Angled Brow Brush (sold separately), brush your brows up to determine their natural shape. Brows fall into one of three categories: an Arch, an Arc or a Straighter Brow. 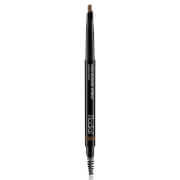 Wet or Dry: Starting underneath the brow and closest to the inside corner of the nose, brush in a baseline that moves across from the inside corner to the tail of the brow. Sketch in a parallel line along the top of the brow using the same stroke, starting in the front of the brow and intersecting with the baseline at the tail. With the spoolie, brush through the guidelines you created and fill in any low, sparse, or uneven patches. Always blend the color, ensuring that there aren’t any hard edges.